The tendency towards the use of thicker and stronger twines in the aft end of trawls coincides with a preference for maximum and easy mesh opening in this area to allow the release of small fish. This makes the resistance to opening of netting panels a key factor in the selective performance of fishing gears. In panels of diamond-oriented mesh, the predominant netting in towed fishing gears, the resistance to opening is mainly characterized by the flexural rigidity (EI) of the netting twine. Sala et. al  proposed a method to measure flexural rigidity through the use of a specially-designed instrument that measures forces and deformations of a small netting panel. Flexural rigidity was estimated through linear regression analysis of the obtained experimental data by applying the asymptotic solution for a bending twine proposed by O'Neill . 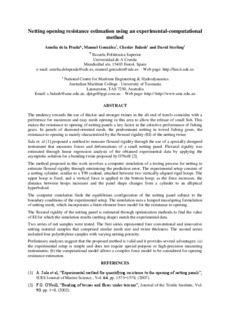 The method proposed in this work involves a computer simulation of a testing process for netting to estimate flexural rigidity through minimising the prediction error. The experimental setup consists of a netting cylinder, similar to a T90 codend, attached between two vertically-aligned rigid hoops. The upper hoop is fixed, and a vertical force is applied to the bottom hoop; as the force increases, the distance between hoops increases and the panel shape changes from a cylinder to an elliptical hyperboloid. The computer simulation finds the equilibrium configuration of the netting panel subject to the boundary conditions of the experimental setup. The simulation uses a lumped mass/spring formulation of netting mesh, which incorporates a finite element force model for the resistance to opening. The flexural rigidity of the netting panel is estimated through optimization methods to find the value of EI for which the simulation results (netting shape) match the experimental data. Two series of net samples were tested. The first series represented four conventional and innovative netting material samples that comprised similar mesh size and twine thickness. The second series included four polyethylene samples with varying netting porosity. Preliminary analyses suggest that the proposed method is valid and it provides several advantages: (a) the experimental setup is simple and does not require special-purpose or high-precision measuring instruments; (b) the computational model allows a complex force model to be considered for opening resistance estimation.